I'd like to thank all those who have bought new saws or had me do saw restoration work for them over the past several months. 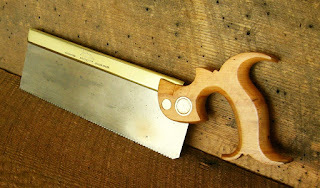 The presence of repeat customers, coming back for their second or third saws, tells me I must be doing something right. Your business is appreciated. Fact is, my volume of saw work has increased so significantly that I have little time for anything else now. That's a bit of a problem because I have a busy summer coming up. I have a ton of home maintenance and other projects waiting in line. And then there's my summer job of helping fight forest fires throughout the country. Last summer, I was away from home fighting fires for 81 days in four different states. Due to my pending busy summer, I'm going to temporarily suspend taking new saw orders or saw restoration work beginning April 1. I'll resume accepting work again in the fall. The exception is saw sharpening. I'll continue to accept saws for sharpening, but there may be delays of up to a few weeks, depending on what else hits my schedule. If I'm lucky, maybe I'll even find a few days this summer to wet a line in a nearby trout stream or otherwise enjoy the beautiful Montana outdoors. Have a great summer, and I'll see you in the fall.